Alpe d'Huez is a ski-in ski-out resort in winter, and one of the most famous road cycling destinations in the summer. At 1869 metres, it's also one of the most snow-sure ski resorts in France. Situated in the southern French Alps and only an hour and a half from Grenoble Airport, Alpe d'Huez has a reputation for being one of the sunniest ski resorts in France. There is a lot of investment going into Alpe d'Huez at the moment, and attracting families to the resort is a main focus. The resort has been awarded the 'Famille Plus' certificate which means that much of the accommodation, restaurants, sports shops and activity companies are specially set up with families in mind. From baby-changing facilities to ski-in ski-out accommodation, Alpe d'Huez makes it easy for a family to enjoy a hassle-free ski holiday. You can rent baby & toddler equipment easily, there are dedicated ski areas for children, top-notch children's ski schools (where you can enroll your child from the age of two and a half), and a wide choice of other winter activities (including a wonderful sports complex and heated outdoor pool). Alpe d'Huez is split into a number of sectors, so it's useful to ensure that your accommodation, ski hire and ski school meet-up points are all in the same locality so that walking to your ski school or the ski lifts is not too arduous - important when you are carrying more than one set of skis! 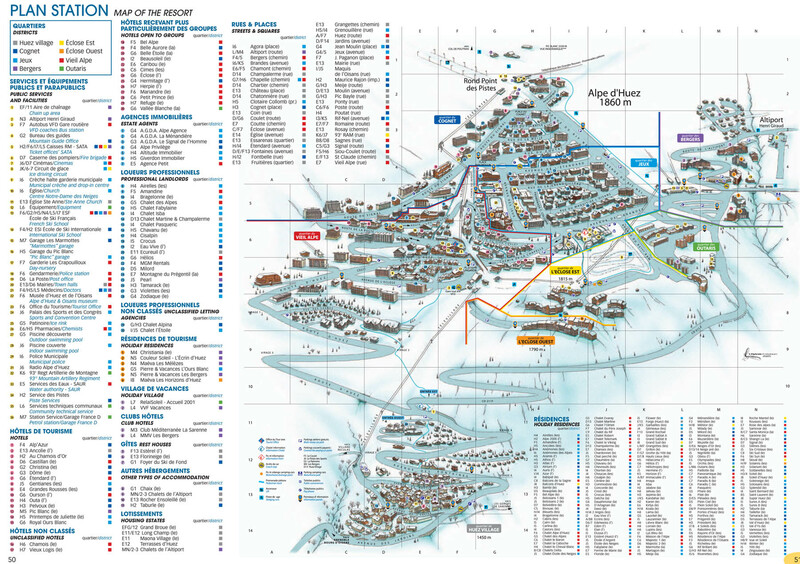 Have a look at a Map of Alpe d'Huez. You can bring babies to Alpe d'Huez too. The slow drive up to resort should not be a problem for them although some paediatricians advise caution because of the altitude. Alpe d'Huez is a great option for a summer holiday as well, particularly if you are a biking family. The Alps are very beautiful in summer with hot sunny days and cool nights, and plenty of activities and events to keep you occupied. Taking the family on a ski holiday can be hard work so finding good family-friendly accommodation is essential to making life that little bit easier. Alpe d'Huez has a wide selection of hotels, chalets and apartments, many of which are family friendly. For ski-in ski-out accommodation try the areas at the top of Alpe d'Huez, around the Bergers district and by the Rond Point up by the main DMC lift. There are nursery slopes accessible from both these places. Or if you prefer to be close to the sports centre, ice rink and outdoor swimming pool, then Jeux may be a better option. Viel Alpe is more central and has better access to restaurants and the centre of town. Alternatively, you could stay in one of the smaller outlying villages which are linked to the main ski area and have their own quieter nursery slopes. Various family ski passes are available at a discount of around 10%, and there are special beginner passes and pedestrian passes available. There are plenty of extras included in your lift pass too. There are actually four lifts that you can use for free in the resort, and children under five can also ski free of charge. Please see our Ski Lift Pass Prices page or Lift Pass Offers for further information. If you have designs on raising the next Shaun White or Chemmy Alcott, then getting your kids into ski school as soon as possible is going to be a priority! Ski schools will take children from two and a half, which is quite young when compared to other ski resorts who normally take them from three. If you want to teach your kids yourself, you can find out more about the nursery & beginner ski areas in Alpe d'Huez in our guide. All ski equipment (and sometime ski clothing) can be rented at the ski hire shops in Alpe d'Huez, either when you arrive or you can book everything online in advance. The ski shops in Alpe d'Huez offer a kids ski pack rental, with skis starting at a length of 67cm and boot size 23 EU. First time skiers will need a helmet, mittens & goggles in addition to skis (poles are not initially needed for kids), and make sure the children have enough layers on to stay warm. Remember to apply sun cream to their faces before they start and place a snack in their pocket, just in case. For 3 & 4 year olds, the focus is on having fun in the snow and games are used as part of the teaching process. Their ski pass is free, just go to the lift pass desk with some ID to obtain the ticket. For children aged 5 and above, you can enroll them in courses according to their level, from beginners to good skiers who are nearing competition level. There are several ski schools in the area offering ski lessons for children. Both ESF and EasySki take children from two and half and have dedicated areas for them to learn to ski. This includes play areas with fun characters and obstacles, gentle drag lifts and magic carpets. The ski area in Alpe d'Huez is well suited to beginners and the nursery slopes can be accessed without a lift pass so you can build up your confidence without having to commit to buying a pass. Once you feel happy to try some higher runs, buy a Beginners ski pass and explore some of the lovely wide green runs off the Rif Nel, Grand Nif Nel, Sagnes and the Ecole 1 drag lifts. Find out more about the Beginners Ski areas in Alpe d'Huez. For more advanced skiers, you have the whole of the Alpe d'Huez Grande Domaine to explore. With 249 km of pistes spread over six resorts, there is terrain suitable for everyone. There are two snow parks in Alpe d'Huez, the larger one being beside the beginner runs above 1800, most easily accessed from the DMC 1st station. Although this is a big park in size it is very beginner friendly with a number of small features providing a gentle introduction to park riding. The other snowpark is in Montfrais and is on the whole for more advanced skiers & snowboarders. For younger kids and first-time skiers, often just half a day skiing is sufficient. So you will be pleased to know that there are other winter activities to enjoy in Alpe d'Huez. The outdoor swimming pool and ice skating rink are in the centre of resort on the Avenue des Jeux. You can rent skates and one free visit to each is included in your 6 day lift pass. There is a fantastic sports complex, the Palais des Sports which is also in the centre of town. Here you will find an indoor swimming pool, squash & tennis courts, a gym, a climbing wall and mini golf and a ball-pit for very little ones. Just next to the sports centre is an outdoor 'Ice Laser Game' where two to twelve players take aim at each other! Other winter activities include sledging (including a dedicated sledging zone for which there is a charge), cinema (look out for films in VO for films in English) and husky dog sledding. There is the X-Fly extreme leisure zone that teenagers will love, which has zip lines, trick jumping on to giant air bags, flaming climbing walls and giant slides. It's also next to the Palais des Sports. For adults that aren't quite so sure of the skiing, there are a number of spas you can try for some indulgence, as well as fitness classes, or perhaps some snow shoeing. Pedestrian ski passes are available at a reduced rate so you can join the rest of your group up in the high mountains for lunch and spectacular views. During school holidays, the tourist office organises plenty of events designed for children, such as carnival parades, lantern processions, fireworks, concerts, face-painting and ice sculptures. Check our Events Calendar for details. Summer holidays in Alpe d'Huez are all about being active and there are a wealth of activities on offer here for all ages and members of the family. Our dedicated guide to activities in Alpe d'Huez includes a section specifically on kids' activities with information on horse riding, short family hikes, high ropes courses, where to go swimming, nature parks, and numerous other fun things that will help make your family holiday as unique and memorable as possible! You can hire just about anything you need for children in Alpe d'Huez. Items such as high chairs, pushchairs, cots, baby carriers and playpens can be rented in resort. There is a concierge company called Wikizi that will help you out with all of these. All the ski shops in Alpe d'Huez offer a kids ski pack rental as well, with skis starting at a length of 67cm and boot size 23 EU. Most will also rent you sledges, strollers and sledge-strollers - look out for the 'Famille Plus' logo. Baby changing facilities are available by the SATA boxes at the Rond Point des Pistes, at the outdoor pool, at the ice rink, in the Palais des Sports, and at the Tourist Office. There are plenty of specialist tour operators who cater for families and have in-house nannies to help with the child care. Children under three may be too little to try skiing so some help with child care is essential if you plan on skiing yourself. Independent nanny agencies are also available, and should be booked well in advance of your holiday. Have a look at our childcare listings page for more information or you can contact the local Tourist Offices for a list of available babysitters. NB There are several municipal crèches in the area but they are generally reserved for French residents, so we have omitted them here. The main winter establishments to help with childcare include the ski schools who cater for children who are two and half years and older. You can book your child in for full or half day programmes and lunch can also be provided for an extra charge. There is also a creche that accepts children from 6 months who are just on holiday, they speak both English and French. Ask at the tourist office for details. Enjoy a spring ski break at the "Ile au Soleil"